Way back in 1990, Uncle Ken and I produced our first dry red blend of Shiraz, Cabernet and Merlot and labelled it “WillowBend”. Our idea was to produce a consistently full and flavoursome wine by blending the varieties that perform best on Ken and Helen’s’ St. Jakobi Vineyard, the property previously owned by my grandfather, and Ken’s father, Oscar Semmler. 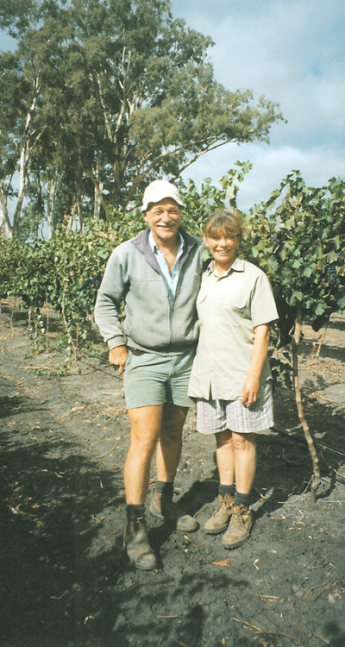 These days the same red blend continues but is now named “Uncle”, as it is Uncle Ken, along with his wife Helen, who nurture the vines that produce the grapes which make their way into this blend. The 2017 Uncle is a mix of Shiraz (57%), Cabernet (37%) and Merlot (6%). These three grape varieties come together to provide a round, soft, red berry fruit palate with fine oak and fruit tannin support. Having produced this red blend for many years, it has always proven to be a wine that can be enjoyed as a young wine, but is consistently reliable in developing rich and complex characters during medium to long term cellaring.